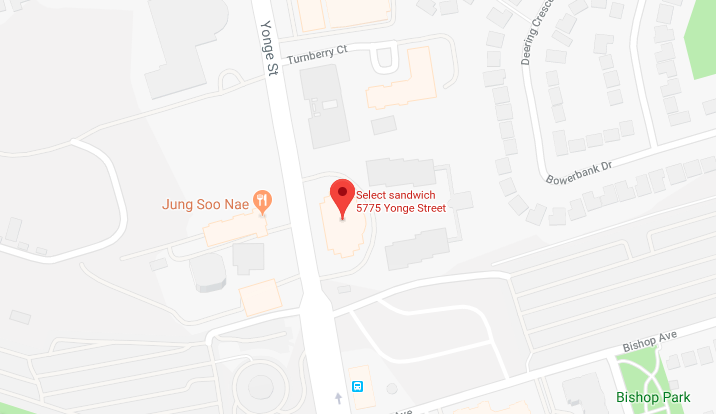 Select Sandwich is located at 5775 Yonge Street, Lower Level, just north of Finch. We offer some of the freshest catering in North York, with delicious sandwiches, wraps, panini, salads, entrees, soups, breakfasts and more made in-store daily. Whether you’re stopping by for a quick lunch, or ordering refreshments for a corporate meeting, our North York catering team can provide you with healthy and fresh options sure to please all of your guests. Select Sandwich can customize your choice of salads, sandwiches and more to suit your tastes and your occasion. Contact our Yonge & Finch store today to place your catering order!